A concert and silent auction will be held to aid victims of Japan's disaster. Musicians and artists from the South Bay have united to present a benefit concert to raise funds for the survivors of Japan's disaster. 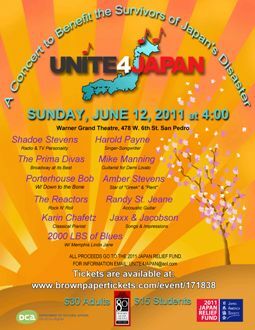 All proceeds will go to the 2011 Japan Relief Fund, administered by the Japan America Society of Southern California. The concert, emceed by radio and TV personality Shadoe Stevens, will feature several prominent LA musicians and bands. In addition, there will be a silent auction featuring donated artworks from renowned local artists.